304 pages | 32 Color Illus. | 186 B/W Illus. Photoacoustic Tomography is an essential reference for graduate students, researchers, industry professionals, and those who wish to enter this exciting field. 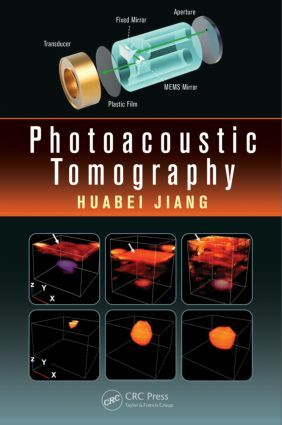 "… a comprehensive accounting of photoacoustic imaging (PAI) methods and related technologies with emphasis on the author's own works. … [a] timely addition to attract readers to this fascinating and relatively new area of research. The book uniquely covers the fundamentals of photoacoustic imaging with descriptions of basic physics, image reconstruction, software development, and implementation. The readers are also exposed to a short account of exogenous probes for PAI application and a few examples of PAI in clinical studies. The book provides a list of relevant references and further reading materials at the end of each chapter. The format of writing is tutorial and therefore I envision it as a reference text for graduate students, biomedical researchers, and engineers who want to embark into this exciting new imaging area." "… a very comprehensive collection of photoacoustic imaging methods, covering everything from the basics of photoacoustic generation and image reconstruction methods to the various implementations, including numerous applications. This is the first time the topic of photoacoustic imaging has been covered in this detail by a single author." Huabei Jiang, Ph.D, is J. Crayton Pruitt family professor in the Department of Biomedical Engineering at the University of Florida, Gainesville, USA. He has published more than 300 peer-reviewed scientific articles and patents. Dr. Jiang is a fellow of the Optical Society of America (OSA), a fellow of the International Society of Optical Engineering (SPIE), and a fellow of the American Institute of Medical and Biological Engineering (AIMBE).